Food Fact Friday: I Heart Key Lime Pie! We’re now in the beginning stages of summer, so I thought I’d talk about my all time favorite refreshing dessert…Key Lime Pie! I’m not a fan of lemon or orange desserts, but Key Lime Pie is definitely in my top 5 all time after dinner treats. It’s a staple on a lot of menus here in Florida. I’ve heard that quite a few people are a little scared to make it, but it’s so simple! It’s honestly one of the easiest desserts to make. The key lime tree, which is native to Malaysia, probably first arrived in the Florida Keys in the 1500s with the Spanish. 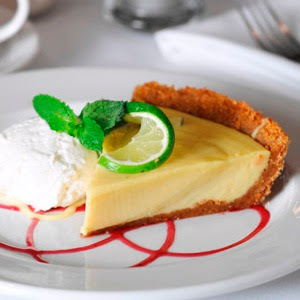 The rumor is that the Key Lime Pie was started in the mid 1800’s, by Aunt Sally, the cook of Florida’s first self-made millionaire, William Curry (his mansion in Key West, Curry Mansion Inn, is being used as a bed & breakfast). When a hurricane in 1926 wiped out the key lime plantations in South Florida, growers replanted with Persian limes, which are easier to pick and to transport. 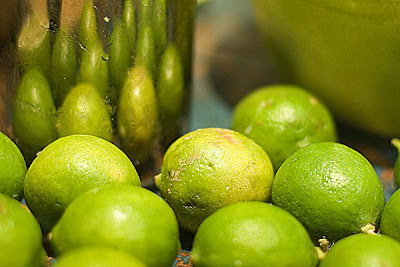 Now, key limes are found mostly in backyards of the keys, or a few commercial outposts in the Miami area. In 1965, Florida State Representative Bernie Papy, Jr. introduced legislation calling for a $100 fine to be levied against anyone advertising Key Lime Pie that is not made with key limes. But the bill did not pass. Finally, in 2006, the Key Lime Pie became the official state pie of Florida. Key Lime Rule: NEVER use green food coloring in Key Lime Pie. key lime juice is not green! – how a Key Lime Pie should look, with a fresh graham cracker crust & lots of whipped cream on the side…yum!